Leave it to JK Rowling to figure out a new way to invoke excitement. 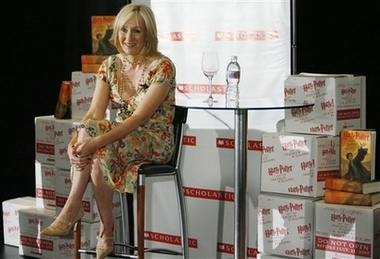 When the best-selling author came to LA yesterday to hold a press conference before a book signing for Los Angeles Unified School District school children she was greeted with flash bulbs and applause. However as she walked to the stage and then sat down she exposed a healthy dose of cleavage and bra-action for all the little wizards in the crowd to get their bludgers heated up. Fortunately a good knight advised the author of her wardrobe malfunction to which JK appeared embarrassed and covered up. The writer, 42, showed a little too much cleavage during a US book tour in front of giggling school kids. She needed more than a magic wand to cover her blushes after a journalist pointed out her dress had slipped down, revealing her underwear. She gasped: “Oh gosh! Thank you for that. Because it was a press conference and she was surrounded by press, you can see video of this spectacle on the Sun&apos;s site.